As Macy’s was preparing to close its doors at the end of the summer, I was thinking about how shopping at a downtown department store was a thing that the next generations of Pittsburghers would not get to do this holiday season. There are still lots of traditions to be had downtown and all around this city, but there downtown department stores are now gone. In my lifetime, there was Horne’s, Gimbels, Kaufmann’s, Saks, Lazarus and briefly Lord & Taylor. But there are future generations of Pittsburgheres who will only associate the name Kaufmann with the family who built the Frank Lloyd Wright house, Fallingwater. So I started thinking, what other holiday traditions have come and gone, or changed over time in Pittsburgh. I am sure there are many other holiday traditions that go beyond department stores and shopping malls. I want to know what other people remember about the holidays from Pittsburgh’s past. I would like to ask your help in helping to capture some Pittsburgh holiday history. Take a break from talking about politics, and talk about something that I am pretty certain everyone at the table will agree on… Pittsburgh. Think along the lines of NPR’s Storycorps, but Pittsburgh style (you know, with fries on top). 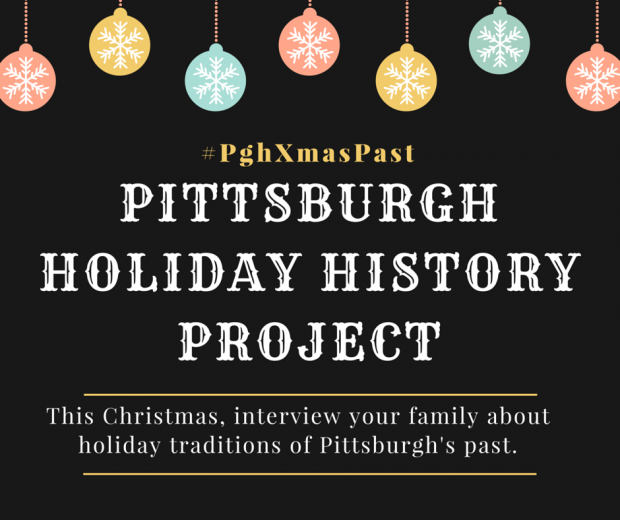 While you are sitting around the holiday table this week, or maybe while you are out for a drive, will you interview your family about Christmases of Pittsburgh’s past? Here are three questions to get you started, feel free to add more or less. Shopping – what are your memories of holiday shopping in Pittsburgh? What was the name of the store? Is it still open? If not, what is there now? Worship – Did you go to church on Christmas Eve or Christmas Day? Where did you go to church? Is that church still standing? Were there any special holiday traditions at this church? Please share your stories in the comments below or if you have a blog, write up a blog post or two and share the link here as well. If you are sharing on social media please use #pghxmaspast. What are you going to do with all of these stories? Not sure yet. I would love to share a timeline of key dates (and photos – please share photos if you have them). I would really like to put together a timeline of department stores in Pittsburgh. Or maybe we can create a map of places past and present. I have been talking with a local archivist about how we could possibly record some of these stories to be shared in the future. At the very least I would love to share some of them here on the blog. I am curious to see how memories change over the decades. When did things shift from shopping downtown to visiting shopping malls? How have holiday church services changed? How many churches are still standing and how many are gone?